The story of Sonora is one of a pure geometrical shape, pursued by designer Vico Magistretti throughout his entire life. The creative path followed by the architect and designer in his projects is a peculiar itinerary: geometry represents a constant fellow traveller. His main source of inspiration is simplification. Created in 1976, Sonora is a suspended lamp available in several materials and sizes, and is one of the symbols of this creative path. It has remained, for the entirety of its 40 years of existence, one of the most appreciated lamps not only by the public but by Magistretti himself. A few years ago, Oluce celebrated the 40-year anniversary of the emblematic lamp in a commemorative exhibition. The exhibition was held at the Understate showroom in Milan, and unveiled two new Sonora bespoke models realized ad hoc for the celebration: the first one bronze and the second one a sophisticated craquelé ice finish. The Sonora suspended lamp is available in several sizes and colors, including black, gold and white. 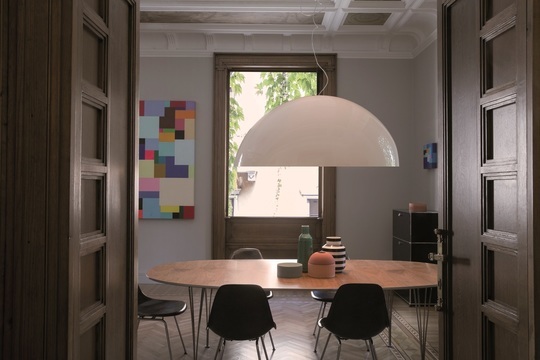 The dome-shaped lamp effortlessly conceals the light and casts light directly downwards when illuminated. Because of its inherent simplicity, the Sonora lamp is just the right fixture for any environment.